Garbage disposals are some of the best little gadgets in the home…except when they stop working. Then you’ve got a problem, and it's often a messy one. There’s plenty that can go wrong: a jammed grinder, something stuck in the grinder plates, a failed electrical connection or tripped reset button; excess food debris that stick or clog; and plain old misuse. 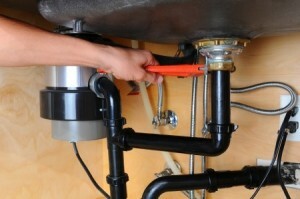 Whatever the cause, the local, reliable plumbers at Troudt Plumbing, Greeley, can fix it. Although disposals seem like they should be an easy honey-do fix, it’s best to call a professional once you’ve tried the reset button, or attempted to clear the clog manually. It’s easy to further damage the disposal, or even cause injury to yourself if something goes wrong. Often, we can resolve the problem quickly and simply by removing the cause of the clog or jam. But if the disposal unit has reached the end of its useful life, or has developed electrical problems, it’s probably best to replace it. We’ll perform a thorough inspection and offer suggestions. It’s also a good idea before running the disposal to check for silverware or other odd items that sometimes slip down into the disposal from your sink basin. Contact the experts at Troudt Plumbing for all your garbage disposal needs, from repair to replacement.